Home > Blog > Safety Tips > Floods Happen – Anytime, Anywhere. Be Prepared! Floods Happen – Anytime, Anywhere. Be Prepared! 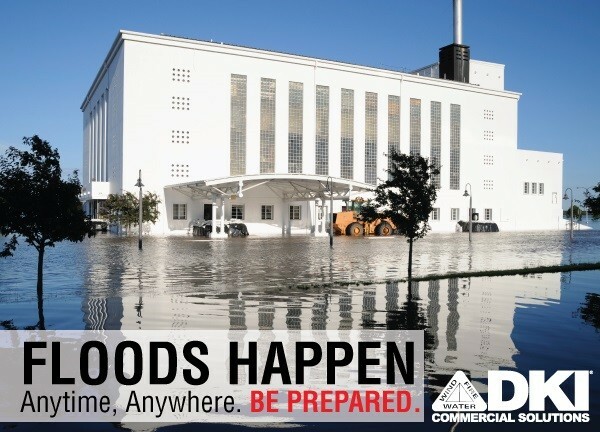 In response to the recent flooding in parts of the U.S., DKI wants to inform you all how to prepare for a flood – what to do before, during and after. If you are at risk for floods, it is highly recommended to purchase flood insurance. Create an evacuation plan with all of your employees. Stay up to date with the news and weather reports. Act quickly & move immediately to an upper level (where water cannot reach you, and where you can escape). Be prepared to evacuate immediately. Do NOT walk across flowing water of 6 inches or higher. Shut off water, gas, and other electrical sources at the main breaker. If you have to, proceed with caution. Do NOT enter a flooded building until given the green light. Keep the power OFF, until officials tell you otherwise. Inspect foundation for structural damage. Check walls, floors, doors, windows and ceilings for risk of collapsing. Dry out damaged items and wet areas. Use fans or dehumidifiers. Disconnect electronics and move to higher ground or a dry location. Roll up area rugs and move to higher ground – to dry out and prevent mold from forming. In the event of a flood, call us immediately to prevent further damage including mold.